Saponti is the Associate Director of Business Intelligence at Dezan Shira & Associates in Ho Chi Minh City, Vietnam. Saponti is responsible for business intelligence projects in Vietnam and the wider ASEAN region. 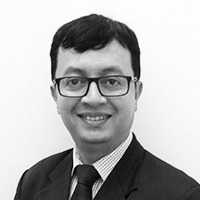 Prior to joining Dezan Shira & Associates, Saponti worked for a leading global risk consultancy in New Delhi where he focussed on both proactive and reactive investigative assignments, spanning due diligence, complex problem solving, business development, risk analysis, whistle-blower investigations and business intelligence. Previously, he worked for a travel risk consulting company where he managed a team of travel security analysts who prepare travel security information, analysis and advice for clients across the world. Saponti began his career as an English-language copy editor for Encyclopedia Britannica in India and previously worked as a project executive for an IT company in Delhi. Saponti received his doctorate from Jawaharlal Nehru University (JNU), New Delhi, where his research focused on the EU’s security and defence policy. His PhD research included field trips to Europe and presenting research papers at several European, North American, Asian and Australian think-tanks and institutions. Previously, Saponti received a first class master’s degree in International Relations from JNU and a first class master’s degree in English Literature from Gauhati University, India. Saponti is fluent in English, Hindi and Assamese, has working knowledge of Bengali and speaks basic Bahasa Indonesia. He is an avid quizzer and has appeared on BBC’s Mastermind. Saponti is a native of Assam in India’s north-east region.